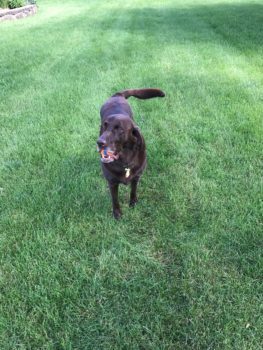 Our 5 year old chocolate lab Molly had a double cranial cruciate ligament (ACL) injury in November 2016 and went through the double TPLO surgery in early December (she wasn’t able to place any weigh on one of her rear legs before the surgery). We started giving her GlycanAid HA in February and started to notice a change in her recovery almost immediately. Now 6 months post-surgery and 4 months since starting her on GlycanAid HA she is back to her old self when it comes to chasing her ball.